The Nikon Close-up Speedlight Commander Kit R1C1 is an exceptional tool for those looking to dramatically improve the quality of their close-range photography. The kit enables superb close-up lighting control with exceptional flexibility and innovative options when used with the Nikon Creative Lighting System or compatible SLRs without a built-in flash. The kit comprises of two SB-R200 Remote units attached to the lens and a SU-800 Commander unit attached to the cameras i-TTL metering system. All exposure and triggering communication is carried out using infra red wireless communication. 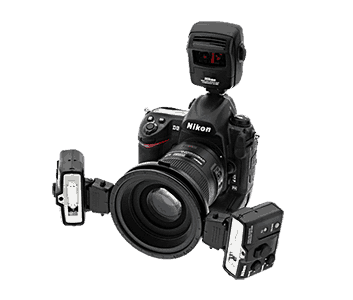 The kit includes adaptors for frontal lighting, filters, and adaptor rings for NIKKOR lens filter screw threads. Additional SB-R200 units or SB-800 and SB-600 units can also be controlled by the SU-800 to offer the ultimate Creative Lighting System flexibility either indoors or in the field. With the Nikon Close-up Speedlight Commander Kit R1C1, producing desired close-up lighting effects is straightforward and uncomplicated. Up to three remote groups and four channels consisting of two SB-R200 wireless remote Speedlights can be arranged to enable creative lighting from the left, right, above or below subject. Settings are easily made and confirmed on the SU-800 Wireless Speedlight Commander’s LCD panel from the camera’s position. The included SB-R200 Wireless Remote Speedlights can be tilted up to 60 degrees to accommodate lenses with short working distances. The kit’s SX-1 master attachment ring accommodates up to eight SB-R200 Speedlights (off camera) and up to four (on camera). SB-910, SB-900, SB-800, SB-700, SB-600 and/or SB-500 Speedlights can be combined and controlled within a lighting scheme for additional creative lighting effects.